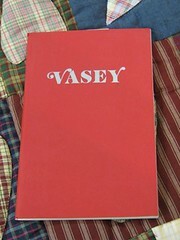 The history of the Family of Richard and Sarah Wood Vasey for whom the community of Vasey, Ontario is named is once again available the museum’s gift store. This book was researched by Gary E. French, author of “Good Bye for the Present-War Letters of Harry Rumney”. Gary’s research was compiled Barbara Vasey Conzelman.